Dan Jurgens signs on as writer of this issue, and presumably those that follow. I am uncertain if this is an open-ended assignment, or if he’s a fill-in until Scott Lobdell returns in the near future. Regardless, I’m pleased. Jurgens is an artist, and understands the art direction a penciler needs to tell a good story. And as a writer, he’s turned in some great work. Will it might not be on the scale of a cosmic Crisis, his stories are always more relatable in some manner. 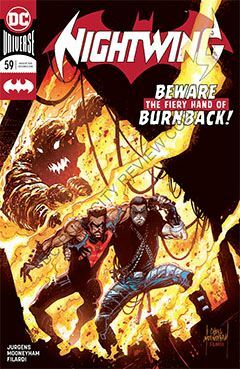 Taking over on Nightwing is apropos, as he is also the current scribe for Batman Beyond. While Jurgens’ history may be more in line with Superman titles, the Bat office is high profile enough that it can always benefit from a writer of Jurgens’ caliber. The issue starts off with Ric Grayson being “trained” by Malcolm Hutch, one of the new Nightwings. It’s just a training session, yet Hutch is still in full costume and mask, though Ric knows full well who he is. Hutch then takes the super-hero skyway – rooftops, flagpoles and cell towers – to a local hospital to visit his former training officer, lying in a coma for the past few years. This fits in with what little Hutch has offered Ric (and us readers) in the way of his backstory. Rich and Hutch reunite in the wake of a mysterious arson at a local precinct, where there is far more to the fire than meets the eye. At which point we reach the end of the chapter. THIS is quality storytelling, because it is mostly adventure, combined with a healthy dose of human emotion. Not the predictable dour and brooding Batman kind, but the inner struggles of heroism. If a protector backs down from a decision, is he still a hero? If a protector pays an almost ultimate price in the line of duty, who is the hero and who is the scapegoat? And, after a lifetime of heroism, does not wanting to be on the front line make one a coward? These questions and more, unfolding amidst the chaos of high adventure and crime fighting, are what make for good comic books, in my opinion. But that’s just my opinion. You mileage may vary.